Pictured holding the dresses are Lynn Werner, Jean Powell, Carol Adams, April Smith, Gay Perrin, Carolyn Thomas, Dean Barnitz, Judy Jewell, Ellie Blaettnar and Emma Powell. Cutting and pinning are jobs for Carol Adams, Jean Powel and Gay Parren. Ellie Blaettnar teaches Emma Powell to cut arm holes in the cases. At the sewing machine is Dean Barnitz, proudly the oldest member of the group, with Lynn Werner and April Smith. Dresses displayed in the sanctuary for the congregation to view during Sunday’s service. POMEROY — Last summer, a notice in the bulletin of Trinity Congregational Church caught the attention of several of its members. 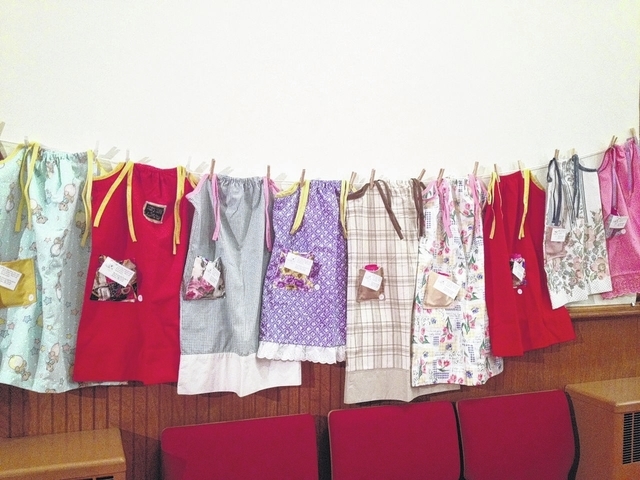 “Little Dresses for Africa” would begin at Point Pleasant Episcopal Church, and anyone interested was invited to see their operations. Several women from Trinity were curious to learn more. Lynn Werner and April Smith accepted the offer and joined Rita Matthew and other Episcopal Church members for breakfast. They learned that “Little Dresses for Africa” is a project to make dresses using pillow cases and is distributed to little girls, primarily in African villages, but also other countries in crisis. “But why use pillowcases?” is the question many people have when told about the project. According to the non-profit organization, there are several reasons pillowcases are the best choice: they are readily available, the hem is already in the material and they come in all sizes and colors. The cases make a great starting point for a simple and quick sewing project. Founded by Rachel O’Neill and headquartered in Brownstown, Mich., in suburban Detroit, “Little Dresses for Africa” is a registered non-profit Christian organization. Volunteers from all 50 states, as well as Australia, Canada, United Kingdom and Singapore, have joined. Some volunteers sew while others donate their time and money to support the effort. Once volunteers complete the dresses,” Little Dresses for Africa” makes arrangements for the pieces to be sent with mission teams or mailed directly to verified communities. Their mission is to provide relief to children of Africa and beyond. To many of these young girls, it is more than just a dress — it is a sign that someone cared enough to make one for them. It is the hope of “Dresses” that by delivering dresses to these young girls, a seed will be planted in their hearts, in the name of Jesus, that they are worthy. On July 23, 2014, women of Trinity Church began their first project. Joined by Episcopal Church members Rita Matthew, July McWhorther and Becky Wood, of Point Pleasant, and Mary Hendricks, of Mason, the women learned the steps in making the dresses. Moving from station to station, one volunteer cuts the arm hole in the case, then passes it to the next person who then presses the top to make a casing. Next comes someone to sew the casing, then elastic is threaded through that casing. The case is passed to have the ends of the elastic sewn before it goes to the person who pins the bias tape around the arm hole. A colorful pocket is added. The final step is to iron the dress. After completing 10 dresses, the group members said they felt they were beginning to “get the hang of it.” To date, the group has sent 38 dresses to the warehouse in Brownstown for distribution. Matt and Kristi Riffle recently delivered another 40 dresses to the Dominican Republic, and many more are hanging in the church sanctuary and lovingly folded in boxes awaiting distribution. The team includes Lynn Werner, Carol Adams, Gay Perrin, Carolyn Thomas, Judy Jewell, Dean Barnitz, Ellie Blaettnar, Emma Powell, Jean Powell, April Smith, Barb Weeks, Donna Nelson, Dee Hysell, Kathy Hysell and Debbie Finlaw. It should be noted that sewing isn’t a requirement. Dee Hysell,who admits she cannot sew, instead prepares lunch for the workers. Attendance is also not required as Weeks makes the pockets for the dresses at her home. The group acquires materials from various sources and donations are always appreciated. A hotel donated several slightly used pillowcases. Thrift stores are scoured for cases and fabric. Others have contributed material they have at home. With warm smiles, they pointed out all the completed dresses hanging in the church sanctuary. Even though the women who have given their time and talent to assemble the dresses will probably never meet the girls whose lives are touched by receiving them, they say it is enough for them to know they made a difference.